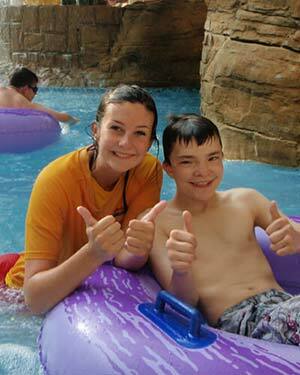 Sandcastle Waterpark is proud to be an Accessible Venue. Our award-winning range of inclusive information, facilities and guest services have been carefully designed to give you the best possible experience with us. Every day we learn from our guests and strive to make our waterpark the best it can be. Whether you want to prepare for your visit with the help of our extensive Accessibility Guide or Sensory Story or take time out in our Autism-Friendly Quiet Room and find out about our friendly Access Ambassadors or Essential Companion scheme, you will find all the information you need here. pool side area, catering and retail outlets and very easy access into the pools. to use it. Click here to view our Changing Place Wet Room video or click here to scroll to this section of our website page. For some people who cannot weight-­bear our hoist and water-­accessible wheelchairs provide an ideal way to enter the pool with ease. 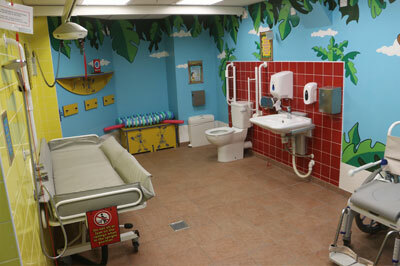 Accessible toilets throughout the Waterpark and in the entrance area. These are available at reception and at all of our catering outlets. Please just ask a member of our team. Use the symbols on the right of the page (also shown above) to increase the contrast, change to greyscale or adjust the font size. On-line audio version of our Access Statement. Click here for an audio version of our Access Statement. Where applicable, there is an audio commentary that plays in real-time alongside our Accessibility video throughout the Waterpark. This tactile writing system is available on toilet signs throughout the Waterpark. Some of our guests with hearing or speech impairment may prefer to contact us using Next Generation Text or Text Relay (a service provided by BT free of charge). Our team are trained in the use of these services and will be happy to take your call. Flashing fire alarmsOur fire alarm system has flashing lights to alert guests who are hearing impaired. setting to access the loop. This sensory story helps to prepare our guests with autism for the sights, sounds, tastes, textures and smells that they may experience during their visit. Please click here to download and read The Sandcastle Waterpark Story. It can help to have a short, ‘familiarisation’ trip to us in advance of your planned visit date to help get used to the journey and the environment. Simply call our Access Hotline on 01253 340721 to arrange a date and time to suit you. You can also click here to email us. worn in our Waterpark, these can be used on all rides except Montazooma and Duelling Dragons. possible, we will endeavour to ‘fast-track’ you through the arrival queue. Guests who find queuing difficult can bypass the bottom queue on Aztec Falls, Master Blaster, Montazooma and Sidewinder waterslides. Just speak to a member of our Waterpark supervisory team, based in the First Aid room, for assistance. room, when you wish to use it. This on-line guide provides details of our information, facilities and services for guests with access needs. Click here to download our Access Guide You can also click here to email us. Water Ambassadors have additional skills, including training for guests with disabilities. If you would like advice on what support we can offer during your visit please contact our Access Hotline 01253 340721 or speak to a member of our team on arrival. All our team have an understanding of your needs and the best ways to support you having been trained in accessibility / disability and autism awareness. socialise, feel safe and supported in a relaxed environment. Book early to avoid disappointment by telephoning us on 01253 340700. There is a ‘drop-off’ area outside the Waterpark. If you would like any assistance from this point please call our Access Hotline on 01253 340721. You can also contact us using the Assist-Mi App before you visit. Guests who have an Access Card which indicates that they need an essential companion will receive a complimentary ticket for their essential companion. For further information on the Access Card Scheme please click here. A selection of vests, woggles and other flotation aids are available to support you during your visit. We also have ‘water wheelchairs’ to enable guests to easily access the water at our sloped pool access points. Please speak to a member of our Waterpark team, located in the First Aid room, for assistance. 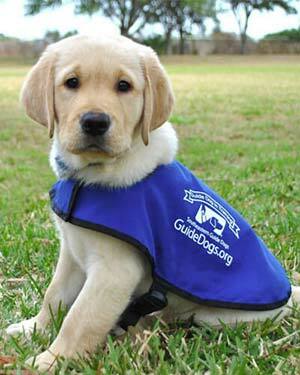 We are happy to look after your assistance dog for you while you enjoy our Waterpark. Please call our Access Hotline on 01253 340721 or speak to a member of our team on arrival. We have reserved tables for guests with access needs, available on request. access needs, available on request. Queueing can be a difficult experience for some of our disabled guests e.g., guests with Autism. Where possible, we will endeavour to ‘fast-track’ you through the queue on arrival. Disabled guests who find waiting difficult can bypass the bottom queue on the Aztec Falls, Master Blaster, Montazooma and Sidewinder waterslides. Just speak to a member of our Waterpark supervisory team, based in the First Aid room, for assistance. 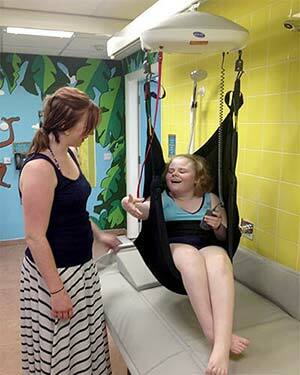 We appreciate that visiting a Waterpark maybe a daunting prospect for some guests with disabilities and their families. With this in mind our Accessibility Evenings are held under special conditions to ensure a comfortable and enjoyable visit for guests with disabilities and additional needs, and their immediate family. Sandcastle Waterpark will be closed for Winter maintenance from 18th November – 26th December inclusive, reopening on Friday 27th December. Bookings – Call 01253 343602. Full payment required at the time of booking. Advance booking essential. Pool accessible wheelchairs available from here. As part of our ongoing program of Accessible facility development, we are delighted to announce that our new for 2017 Sensory and quiet room has just opened. 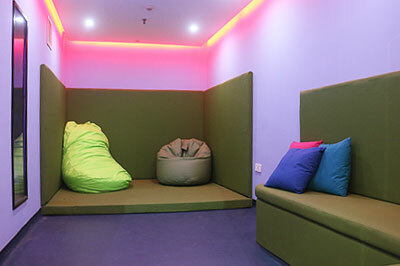 The room features an integrated bubble wall, adjustable mood lighting, seating area, air conditioning and relax and chill area with large, colourful bean bags. This room has been designed as a calming and relaxed space for guests with additional needs, and is somewhere for them to go and take a little time out. Managing Director John Child explains “We are proud to be the first Waterpark in the UK to open a Quiet/Sensory room for our guests”. Many of our guests that experience sensory disturbance now have a quiet, calming and tranquil room available to use which we hope will contribute to an enjoyable and memorable visit. Our Quiet/Sensory room is located within the Waterpark and is available all day, every day for use. 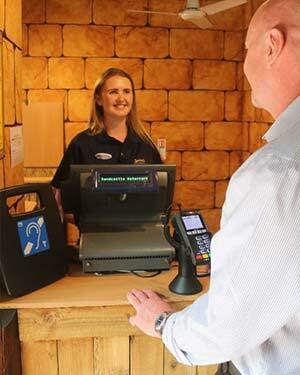 Guests wishing to use the room simply need to speak to any member of our waterpark team to gain entry. The first operational hour of each day at Sandcastle Waterpark is our “Silent Start Hour”. During the first hour there will be no music played and only essential announcements will be made. We recognise that for a growing number of our guests with additional needs, this should help create a more calming start to their visit. Sandcastle Waterpark offers one free essential companion admission for Access Card holders when purchasing one standard admission ticket for a disabled guest. To take advantage of this offer, please show your Access Card at reception on arrival. Please note that this offer is not available for bookings made online. One free essential companion ticket is for standard admission and does not include Hyperzone or Sea Breeze Spa wristbands, these may be purchased on arrival at the gate price. Not valid in conjunction with any other offer or promotion. 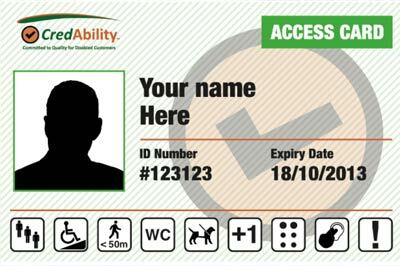 For further Information about Access Card, please click here to visit their website.